It was sometime in November that I decided to climb Great Hetha. 'Course, in the dark days of November and December, and what with the eighty mile drive and everything, there just wasn't enough daylight for me to do this and have a reasonably long walk to make it worthwhile, given the difficulties I have in getting out of bed whilst it is still dark . . . So I waited till January - about mid January when it started getting a bit lighter. I bought a chocolate muffin and a banana and determined to set off very early one Wednesday morning. Tuesday night was blizzard night. The neighbours failed to get to work. All routes out of town were blocked till lunchtime. The UK had seized up, including the road to Great Hetha. Attempt one ended before it started. It snowed till February, roughly speaking. Then it was March. I decided to have another go. I bought a new chocolate muffin and a fresh banana and I told the dog. At dawn, thereabouts, we left the house. I couldn't get into the garage. I returned to the house along with my excited dog. We ransacked the house fpr the garage keys. I broke for coffee and a chocolate muffin at about eleven. At half past I found the keys. Next time. I would go next time. A week or so later, I bought another chocolate muffin and a new, particularly yellow banana. I had the garage keys. No snow was forecast. I was without any viruses or indeed any other excuse and the dog had been wormed. The night before we set off, I told the dog all about it. We were both excited. It was just after dawn the next day when I rang a well-known car recovery organisation. They'd be an hour. It was always busy at this time of day. I pushed the unconscious car out of the garage and into a recovery position. The man arrived at about eleven, just after I'd scoffed the chocolate muffin, and he told me that the battery had gone the journey, unlike me, who wouldn't be going anywhere until he'd sold me a new one at an outrageous price. I thanked him, went off to get one at "Batterybusters" and by lunchtime, the car was working again. Too late to set off now. The day before yesterday, I bought a blueberry muffin (they had no chocolate ones) and yet another banana. 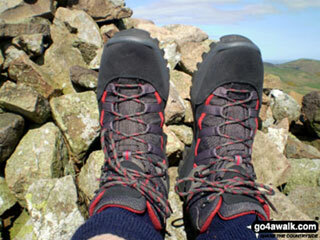 Below is a picture of my boots on the summit of Great Hetha. Lovely, sunny day, it was. Nice neck of the woods, too. We followed this with an amble along the Border ridge and back down the Colledge valley. It was all worth it, but sometimes, do you think that fate may be trying to tell you something? Or is it just bad planning? Every now and then, it would seem, there's a hill which, despite my best efforts, I just can't seem to get at. Great Hetha was one of these. Its rather nice. It has a hillfort on the top and a grand view and singing larks . . .
My new boots on Great Hetha near Hethpool. Photo by Mike Knipe.